Home › Latest News › Ducktails on Softails®! Picture it: A beautiful Durban summer’s day, not a breath of wind in the air, sun shining and a row of sparkling new 2018 Harley-Davidson® motorcycles all looking at you. Sounds like a dream doesn’t it? Well this dream was our reality this past Saturday at our Ducktails on Softails® event at Harley-Davidson® Durban. If you were not here, you missed out on a fantastic day of riding and fun had by all. We were lucky enough to have an excellent turn-out on the day with a total of 35 demo rides done. 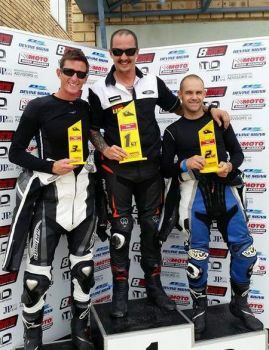 Amongst the riders, we were fortunate enough to have the expertise and experience of Juan de Wit, a well-known regional race bike rider in the KZN regional championship. Juan rides in two categories – the Formula Extreme 1000cc and 300cc classes and has finished second and first respectively. “At first glance, the new Fat Bob®took my breath away! The bike looks the part and is not your traditional looking Harley® at all, I was very eager to hop on and go as I was sure that the bike would deliver on performance as well as it does on looks. And boy, did it deliver! “My second Demo ride was on the 750 Street Rod® and I must say that if I was going to get an all-round bike this would be the one for me. It may not be the strongest or fastest Harley-Davidson® model, but it delivers a ride that will make you want to keep going and take the long way around to your destination! As the day progressed, we were constantly hearing words like “Awesome”, “Amazing”, “Mind boggling” and our personal favourite was “I HAVE to have one!”. We would like to thank all our visitors on the day. Some rode, some supported and all that were present on the day made our Ducktails on Softails® day a huge success. Keep your eyes peeled for the next Harley-Davidson® Durban event which happens on 9 December 2017. This promises to be a day like no other with our very own Harley-Davidson® motorcycles on a race track! Who would ever have thought that would happen? We look forward to seeing you all there!